FIFA World Cup Russia 2018 is going to start from 14th June. This is the most popular game in whole world. The Fédération Internationale de Football Association (FIFA) arranges the league every four years in different countries and select one champion team for next four years. Download full world cup schedule. 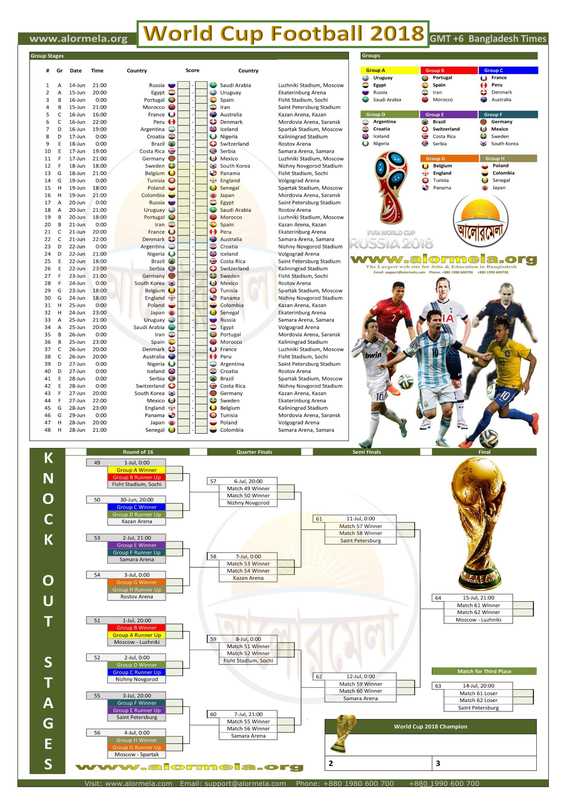 The World Cup Football 2018 schedule is created according to Bangladesh (Dhaka) GMT +6 time zone. Click on the picture to download it as high resulation file. You can get it as HD file from the below under attachment. This year FIFA World Cup 2018 is hosting in Russia last time was Brazil. In this world cup tournament, there are 32 teams participant in eight group (A, B, C, D, E, F, G and H). Four teams will play in each group. The tournament is hosting by 12 different different stadium/venue (destination). The fixture is prepared using the Russian local time and Bangladesh time BDT (GMT +6). Which team do you support? You can write it in comment area and support your team.